3. FMY-98 88 - 108 MHz. Entire Band 10 dBi. 4. FMC-98 88 - 108 MHz. 3 MHz. 3 dBi. 5. FMC6-98 88-108 1.5 MHz 6 dBi. 6. FMV-88-108 88-108 MHz 10 MHz 6 dBd. The FM-1 FM Band Antenna offer classical choice of antenna configuration with circular polarization. The FM-1 FM Band Antenna have low VSWR and high gain covering the complete FM broadcast band from 87.5 MHz. to 108 MHz. This antenna can be mounted on the side of a square/triangular lattice antenna-tower for uniform Omni directional coverage. The FM-1 FM Broadcast Antennas are supplied with dismantled dipole arms for easy handling and transportation and are assembled at site with simple hand tools. The FM Band Antenna can be supplied with 2 bay (FM-2), 3 bay (FM-3) and 4 bay (FM-4) along with suitable power splitter/combiners and phasing cables. The FMY-98 FM band Yagi Antenna is highly directional, comes factory tuned and does not require any field adjustment. The FMY-98 Yagi Antenna is highly suitable for Horizontal or Vertical transmission or reception. The FMY-98 FM yagi antennas when packed, comes with elements removed from the antenna boom for ease of packing and transportation. The FMY-98 yagi antenna is highly suitable for low power broadcasting / receiving applications with choice of linear polarization either Vertical or horizontal. FMY-98FM band yagi antenna has a directional gain of 10dBi with moderate horizontal and vertical beam-width. The FMC-98 Omnidirectional FM Fiberglass Collinear Antennas is rugged all weather model, sealed in a fiberglass tube, having excellent transparency for RF signals and enough strength to withstand specified wind loads. The FMC-98 fiberglass collinear antenna is highly suitable for Vertical polarization transmission or reception with excellent horizontal omnidirectional radiation pattern and constant gain over 360 Degrees. Omni-directional antenna FMC-98 is an excellent choice for small campus broadcasting with medium power. FMC6-98 FM band Fiberglass Omni-directional Collinear Antenna is rugged all weather model 6063T6 ultra corrosion resistant architectural aluminum, high class brass alloy and does not require any field tuning or adjustments. The antenna is supplied in two segments for easy of handling and shipping. The upper and lower portion of antenna is threaded together to prevent RF inter-modulation and antenna is completely protected within a high-tech ruggedized radome to ensure survivability in the worst environments condition. The fiber glass enclosure has excellent transparency for RF signals and enough strength to withstand specified wind loads. The antenna termination is enclosed at bottom of the antenna for complete weather protection. The FMC6-98 is a center fed design which eliminates the distortion of the radiation pattern and ensures a true omni-directional horizontal pattern. The special stub matching is used for smooth VSWR and constant 6dBi gain over the specified frequency band. The collinear antenna consist of large diameter brass radiating elements stacked vertically, fed in phase and enclosed in fiber glass tube. The mounting hardware is made of type 316 marine grade stainless steel and supplied with the antenna. The antenna is highly suitable for small power community broadcast application. Antenna Experts manufactured SD series Stacked Dipole Antenna for higher gain and higher power broadcasting applications. SD series FM band stacked dipole array is manufactured using 6063T6 ultra corrosion resistant architectural anodized aluminum alloy. Powder coating of the complete antenna provides extra protection against corrosion in saline weather present in coastal areas. The SD series FM band stacked dipole array is heavy duty features, wide bandwidth, high gain, high power handling capacity, low VSWR, low noise performance and null filling coverage with omni-directional characteristics. This stacked dipole array is highly suitable as base station antennas vertical polarized wave. The SD series Stacked Dipole Array consists of two/four folded dipoles stacked vertically, fed in phase. These Stacked Dipole Antennas operates at D.C. ground for protection against lightning. The stacked dipole antenna is suitable to mount on the top of tower and is supplied with two marine grade stainless steel mounting brackets. When the two/four dipoles are arranged 180/90 degrees apart around the central mast, an omni-directional radiation pattern results. Aligning the two/four dipoles collinearly (facing in one direction) an offset radiation pattern is obtained. The radiation pattern can be changed in the field by use of common hand tools. The LP-88-108 FM band log periodic dipole antenna use 6063T6 ultra corrosion resistant architectural anodized aluminum alloy and designed to provide wideband directional transmission/reception of radio signals from 88-108 MHz bands. The specially designed mounting arrangement of FM band log periodic antenna results in fast installation. The extra spacers are used between the support booms to improve mechanical durability of antenna. This FM band log periodic dipole antenna system is particular suitable for transmission, reception, monitoring, surveillance, scanning and jamming applications due to its broad band design feature. This high gain FM and LPA provides strong performance over the entire frequency of 88-108 MHz as the LPDA does not use loading technique to reduce the overall size of array. The FMV-88-108 high performance FM broadcast sacked dipole array is designed for use with community broadcast station for vertical polarized omni-directional coverage. The FMV-88-108 antenna is consisting of 6063T6 ultra corrosion resistant architectural anodized aluminum alloy. The FMV-88-108 is heavy duty stacked dipole array features, wide bandwidth, high gain, high power handling capacity, low VSWR, low noise performance and null filling coverage with omni directional characteristics. This stacked dipole array is highly suitable as base station antennas for FM broadcasting sites. The FMV-88-108 Stacked Dipole Array consists of FOUR dipoles stacked vertically, fed in phase. Termination of phasing harness cable sealed by heat shrinking tube making stacked dipole antenna waterproofing. The 9 Meters long central mast for mounting the dipoles is shipped in four sections of 3 Meters each for easy of shipping. The stacked dipole antenna is suitable for side mounting on the tower and is supplied with mounting hardware to mount the antenna on the side of the antenna tower. The antenna is supplied with 4 ways power splitter and 4 number of low loss phasing harness cables (one each for each dipole). The complete antenna system, power splitter and its phasing harness cables are weather proof. 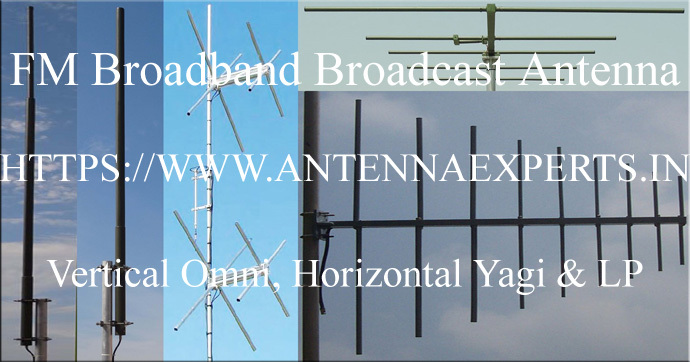 Antenna Experts would be pleased to discuss your specific requirements in more details.